As one of the most comprehensive maintenance programs available, MINI’s Boot to Bonnet Maintenance Program covers all factory-recommended maintenance for up to 3 years or 36,000 miles. This maintenance program comes at zero cost with every new MINI purchase. Services covered under the Boot to Bonnet program include wiper blade inserts, inspection services, engine oil services, cabin air microfilter, brake fluid service, and much more. All services are performed at an authorized MINI dealership by a MINI certified technician to meet MINI’s high quality standards. Drivers can simple schedule an appointment at an authorized MINI dealer while the vehicle is covered by the program to receive these services at no cost. MINI of Pittsburgh is available to help with all of your service needs. Convenient online service scheduling is available at http://www.miniofpittsburgh.com/ServiceApptForm. Franca Sozzani, chief Editor of Italian Vogue, has designed and presented her own MINI model to celebrate of the 20th anniversary of the Life Ball charity event. MINI has worked with the Life Ball since 2001, offering up a new car each year for celebrities to customize for the event. This year, a MINI Roadster received the creative touch of Sozzani. 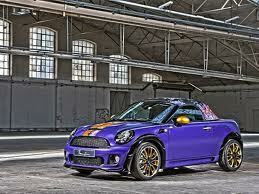 She gave it a quirky gold-striped purple exterior, gloss black detailing and a floral design for the soft folding top. To compliment the Roadster’s fashion-inspired look, the Life Ball presented a 20-year retrospective of fashion, which gave famous models like Eva Padberg and Karolina Kurkova the chance to don blast-from-the-past looks on the runways. After the fashionable festivities, the MINi Roadster was auctioned off at the AIDS Solidarity Gala to raise 54,000 Euro for AIDS-fighting projects. For MINI fans around the world, Le Castellet, France was the place to be from May 11th-13th for MINI United 2012. Over 30,000 MINI enthusiasts from almost 50 countries gathered to experience the MINI brand in all its glory. Rock legend Iggy Pop and Grammy nominated duo The Ting Tings were among the acts that set the crowd into a frenzy of dancing, partying, and fun. Gossip put on a sensational show with front woman Beth Ditto, who has been called the “Coolest Woman on the Planet”. The unique gathering brought several MINI models to be enjoyed by lovers. MINI fans from the USA, Japan, Canada, Great Britain, Russia, and beyond were in attendance, some even driving their own MINI as much as 4,032 miles! Stunt shows, test drives of the latest MINI models, and an exclusive preview of the new MINI John Cooper Works GP were just a few of the highlights MINI devotees were able to enjoy. MINI of Pittsburgh is proud to host the “Drive for Patients” Blood Drive at our MINI Showroom on Baum Boulevard. The Blood Drive will be held Tuesday, May 15, 2012 from 2:00-7:00 pm. To schedule your life-saving donation, contact Jason Karpa at Jason.karpa@miniofpittsburgh.com or 412-682-0788. Please bring ID with you on the day of the blood drive. Proper ID is required to donate blood. Approved forms of ID include a Central Blood Bank or military ID, driver’s license, or passport. A birth certificate along with a picture ID that includes the donor’s full name is also acceptable. The Central Blood Bank strives to advance transfusion science and help patients with clinical expertise. MINI of Pittsburgh is proud to sponsor this amazing event. Show a little MINI love and stop by the MINI Showroom at 4900 Baum Boulevard. Thank you for your continued support of our community events. With summer just around the corner, it’s time to feel the sun on your face and the wind blowing through your hair. The best way to do this is by dropping the top on a new MINI Cooper Convertible or Roadster. The 2012 MINI Cooper Convertible offers fun handling and an appealing exterior with excellent fuel economy. This zippy and agile small car boasts impressive 25 city/33 highway MGP. The convertible soft top provides an open feel with the capacity to comfortably seat up to four passengers. The 2012 MINI Cooper Roadster’s stylish drop-top is sure to make it your favorite car to drive on a sunny day. The Roadster’s nimble handling and two passenger seating give it a sportier look and feel. With the same great fuel economy as the MINI Cooper Convertible, it’s a tough choice to have to pick one. Stop by MINI of Pittsburgh today to get your summer-ready MINI Cooper Convertible or Roadster. Our team will be happy to help you.